Yes, you have read that right.. McDonald's, the world's largest restaurant chain will soon be serving Koronadal City and South Cotabato. 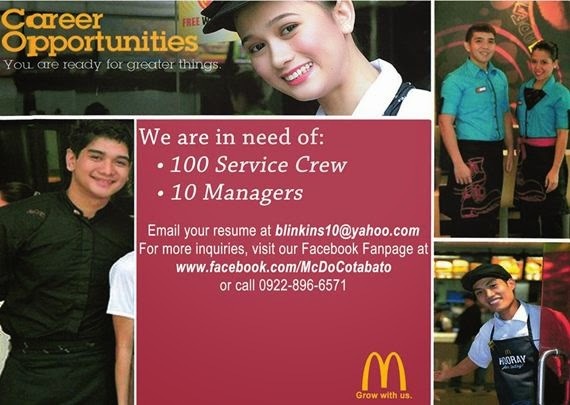 This is already confirmed and they are now looking for applicants for service crews and management trainees. 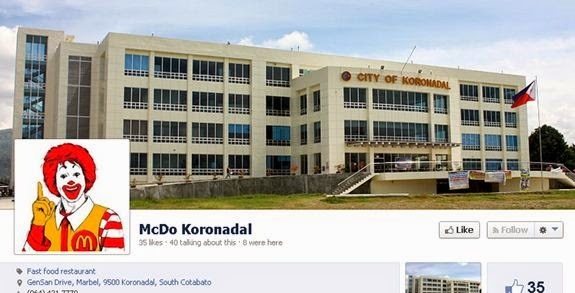 McDo Koronadal Facebook Page has been created. Check out the following job hiring announcement for McDonald's Koronadal below. There will be a screening and job interview for Tacurong City and Sultan Kudarat applicants on May 14, 2014 at the Public Employment and Service Office (PESO), 2nd Floor of Tacurong City Hall. While interested applicants from City of Koronadal and South Cotabato may inquire at the PESO Office located at the City Hall of Koronadal or call 228-1739 for schedule of job interviews and other information. You may also submit your resume and application through email at blinkins10@yahoo.com. We will be posting more updates about McDonald's Koronadal here so keep posted.